Football development is evolving. As things are disrupting in the technology space to advance the sport; there are other areas in which innovation is also taking place. Football players and other key stakeholders are taking development in their own hands. In 2017, we saw Common Goal grow into a powerful movement where football players, managers and supporters share a mission to change the game for good. 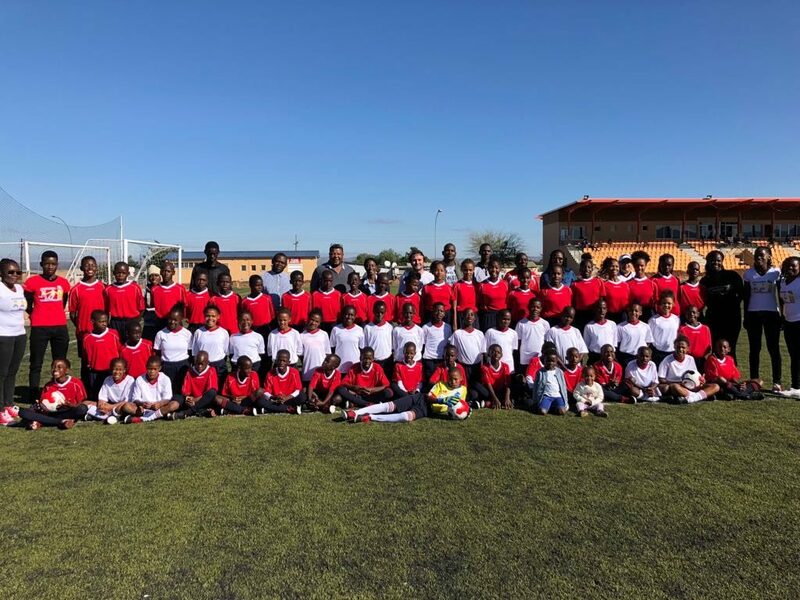 At The Football Business Academy, we are committed to make impact beyond our educational mission which is why we joined forces with our Professors to support the Kasaona Football Academy, a project lead by Namibian footballer Mamie Uerikondjera Kasaona. Mamie Uerikondjera Kasaona was born into the Himba tribe in a small village from the Kunene region in northwestern Namibia. Despite decades of colonial rule and the country’s rapid globalization since gaining independence in 1990, the Himba remain Namibia’s most iconic and traditional people. Its communities live much as they have done for hundreds of years, meaning that Mamie has had to overcome strong cultural and religious barriers to play football and pursue her dreams. Growing up in a community where, especially for girls, farming and getting married early is considered more important than education, let alone sports, Mamie still managed to complete her primary and secondary school despite the great distances from her village. Her journey into football started at a very young age when, against the community’s approval, she started playing the only game the village boys played – football. Using a ball made out of socks and rolled up plastic, they would venture into any empty space they could find and kick it around with their bare feet. It wasn’t until she was 16 that she put on her first football shoes and kicked a real football. That year, women’s national team head coach Jacqui Shipanga was on a talent identification visit in the Kunene region as part of the Namibian Football Association’s (NFA) women’s awareness campaign and ended up inviting Mamie to the national trials in Windhoek. While developing into a national team player, and later captain of Namibia’s women’s team, she even completed a diploma and advanced certificate in Education. “I’ve always wanted to prove people wrong that, yes, you can be a good football player as well as a good and excellent academic performer,” Mamie explains. 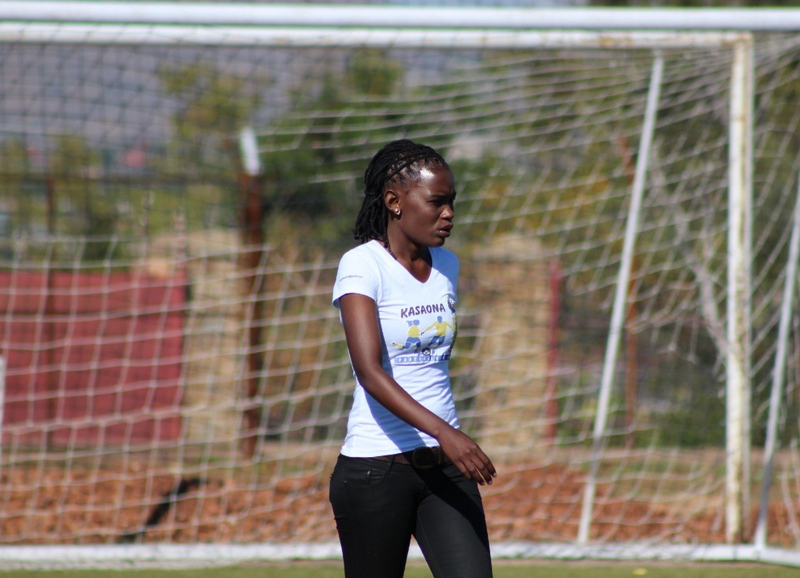 After completing her tertiary education, Mamie received an opportunity through the NFA’s women’s football collaboration with Germany’s Westphalia football region to play in Germany for almost 2 years. During her professional career spell in Germany, she also completed a C License coaching certificate, coached young kids during physical education, and obtained an international grassroots certificate. Though still only 24 years old, she was not only making it as a successful and respected professional football player but was also developing the much need knowledge and experience she would need to create her very own football academy. Mamie continues: “The skills and values learned through sport are especially important for young children given that most young children in Namibia have few opportunities through sport. Sport and football in particular therefore can be used as such vehicle to give them a chance to be leaders and improve their confidence and self-esteem.” Using this approach, the academy hopes to give the young players enough reasons to dream, be it by polishing the rough diamonds that they are into well-rounded players who one day may end up defending Namibia’s colors on the world stage, or by giving them the foundations to nurture their own future without fear of dictation by any form of power. “I want to be an example to them as a Himba girl playing football and not doing too badly for my country and myself,” Mamie concludes. 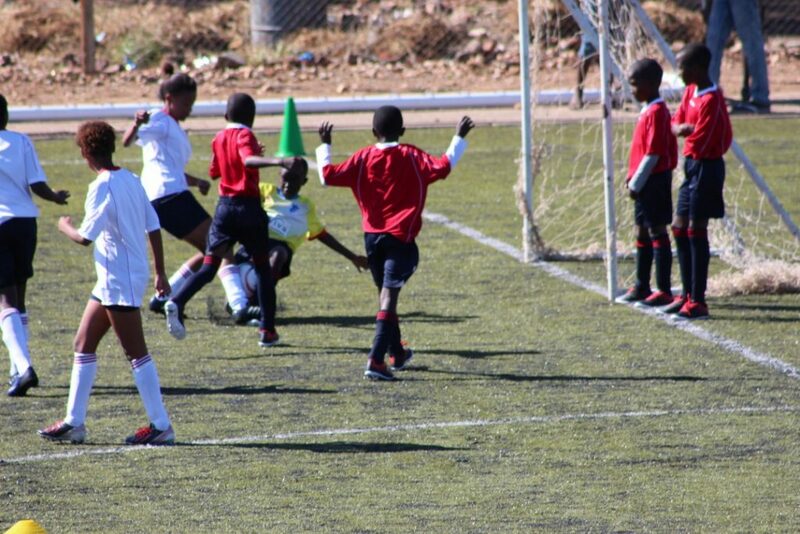 The academy currently has around 80 players who come from diverse regions such as Omaheke, Otjozondjupa, Erongo, Omusati, and naturally Mamie’s own Kunene region. Mamie is the manager and head coach of all age groups and counts with the voluntary support of former national team goalkeeper Novatha Paulus and her assistant coach Vipuaa, while Justine Nikanor takes care of the general administration. About two months ago, the first connection between the Kasaona Football Academy and The Football Business Academy was made when FBA Professor Mayi Cruz Blanco brought Mamie’s story and project to our attention. Good-hearted and passionate as our Women’s Football Development and Leadership Professor is, she was quick to realize that joining forces and working together with the wider FBA family would amplify the impact of any support that would be sent to Mamie’s academy. “Mamie represents a new generation of football players who understand the impact of the game beyond the sporting context. I believe that helping young women and men like Mamie to drive their own projects will spearhead a new dimension of development,” Mayi says. Last Saturday, our CFO Tanguy de La Fontaine set out towards Windhoek, the nation’s capital, to give the boys and girls of the Kasaona Football Academy their new uniforms and equipment. With 5 large sports bags filled with t-shirts, shorts, socks, shoes, shin guards, footballs, pumps, whistles, cones and more, he arrived at the NFA Soccer House where more than 80 kids, coaches, officials, and media representatives had gathered. “We decided to support Mamie’s project because she perfectly understood the tool for development and the weapon against imbalance football represents,” Tanguy highlighted. As the morning filled with pride and smiles despite the scorching Namibian sun, some 60 boys and 18 girls between the ages of 9 and 15 lined up patiently to try on their uniforms and shoes before rushing off to the pitch to try them out. “Whatever you give to Mamie is in good hands,” said Salome Liyambo, Development Officer at the Namibia Sports Commission. And the results are already showing, as “the first girl that joined her academy is now already in the U15 national team of Namibia. This is definitely history in the making,” she concluded. Jackey Gertze, Head of Women’s Football at the Namibia Football Association also expressed her happiness with the event and the project: “I am really happy to see the kids playing at Kasaona Football Academy. Youth girls football development is really great in Namibia, with already more than 20,000 girls across the country playing football, and Mamie’s academy will possibly also attract a lot more of young girls and contribute to the overall national development program for girl’s football.” With women’s football gaining popularity and attention in Namibia and elsewhere around the world, it is important to keep the momentum going to lay the foundations for a future with equal opportunities. “Supporting Mamie is also a tangible way to advance gender equality and will signal other women that they too can take the lead in making impact in football,” Mayi Cruz Blanco echoed. “My words cannot really express how grateful and honored I am to receive this donation,” Mamie said smilingly. “The future looks bright,” she added determined.